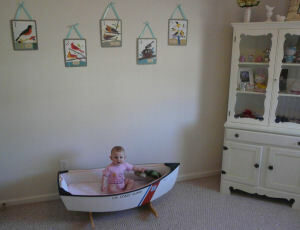 Our baby girl, Magnolia's shabby chic nursery in pink with a vintage sailboat that she loves to play with. I had many decorations for Magnolia's shabby chic nursery collected but wasn't able to put them in place for a little while. We are a military family and move quite a bit and moved from Florida to North Carolina when our baby girl was just two weeks old. Thankfully, she was born a week early so we had a few days rest between the hospital and packing for the move! Throughout my entire pregnancy I knew we would be moving so I didn't set up a nursery. Once we got settled, I knew the theme I wanted would be shabby chic. 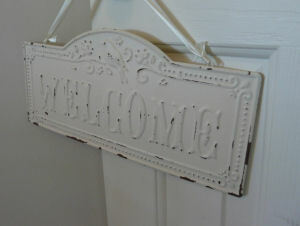 A chippy sign hung by an ivory ribbon on the door welcomes visitors to enter and enjoy Magnolia's nursery! 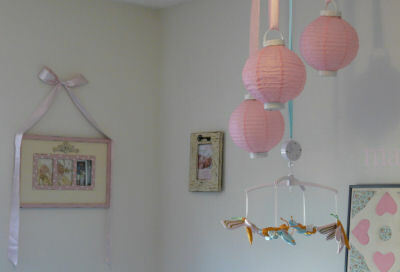 Also hung by satin ribbons are the three pink paper lanterns and a dragonfly mobile in the middle of them. I suspended each decorative element of the arrangement from the ceiling using pink satin ribbon. The varying shades of pink in the ceiling decoration complement the framed quilt square above her crib was handed down through my husband's grandmother's family. It was originally made sometime in the 1930's and has since been cut up and made into different things. She has some bibs made from old family quilts that are the most absorbent bibs I've ever seen! I believe that one is hanging on a hook in the pictures. I bought picture frames and other small decor items as I found them. 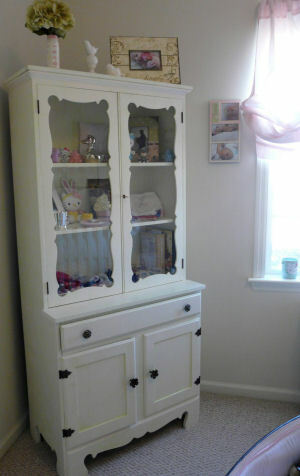 Instead of a baby dresser I wanted a vintage china hutch. Eventually we found the one that we used on craigslist for only $75! The piece was very well used. but after we refinished it with a soft green and a soft pink paint along with a crackle coat finish it looks amazing. Inside the open part of the hutch I have several things of importance arranged where we can enjoy them. Magnolia's jewelry jewelry, my baby blanket that I came home from the hospital in and all kinds of little things people have made for her are on display. Her baby bedding was from the "shabby chic" line at Target. The Coast Guard boat cradle was made by my husband's parents. His father did the woodworking and his mother made the mattress and bedding for it. As much as we would love to paint her room a soft green, we are not planning on staying here for longer than a year so we left the walls white and instead added the wall decals above her crib. I believe that sums it up the process of decorating Magnolia's shabby chic nursery. If you have any other questions about our baby girl's nursery just ask. I hope that you enjoy our baby nursery ideas and will vote for our entry! How did you attach the satin ribbons to the paper lanterns. I had no difficulty using thin cords but am having problems attaching the wide ribbon that I want to use as a hanger for the mobile. This is so great! 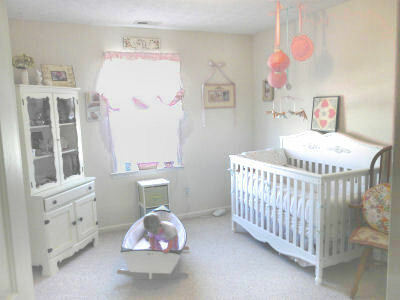 I love the baby bed, and using a china cabinet instead of a dresser. Absolutely perfect, and an inspiration for making the perfect room on a budget! Bravo! The room is outstanding and the baby pictures taken in the china cabinet were out of this world a very talented mother and decorator. The coast guard cradle is one of a kind! Magnolia is perfect for this setting good job. Should be in Decorating books. A beautiful room for the most beautiful baby in the world. I love this room! It is so cute! Its so amazing! I love the china hutch and boat! JUST BEAUTIFUL!! iT SUITS THE BEAUTIFUL LITLE GIRL. vERY CLEVER TO REFINISH AND USE THE OLD CHINA CAABINET AND i LOVE THE USE OF THE OLD QUILT PIECES. Join in and write your own page! It's easy to do. How? Simply click here to return to NURSERY PICTURES CONTEST 2 .